Which is good, because this week, my wreck of choice involves a site very close to home. I look out at this place every day, and have stood on the shores and watched the waves plenty of times. 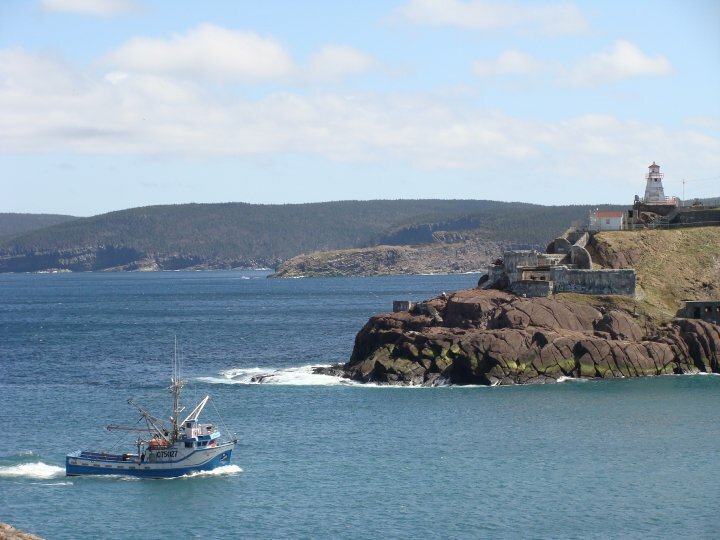 Fort Amherst and its lighthouse are one of the most iconic images of St. John's, and this week we're looking at a wreck that was tossed right up onto the rocks below her. We're looking at the wreck of the SS Marsland. Built in 1926 by Lithgows Shipbuilders in Glasgow, the Marsland was primarily a cargo ship. There is not much written about her career prior to her sinking, but there are plenty of pictures of her visiting St. John's and Corner Brook delivering salt and other cargo. Like many other vessels of her time, she was familiar with the Europe to Newfoundland run, taking salt fish and other exports to Portugal and Spain, and returning to Newfoundland with her holds full of fishery salt. She was returning from one such trip, from Cadiz, Spain in early July 1933. As Marsland approached the entrance to St. John's harbour her skipper, Captain Williams, noticed that there was more traffic than usual at the entrance. A small schooner suddenly cut across the path of the ship, causing Williams to order the engines into full reverse, and the wheel hard over. He managed to swerve and avoid the schooner, but ended up grounding the Marsland on the Vestal Rocks below the lighthouse at Fort Amherst. 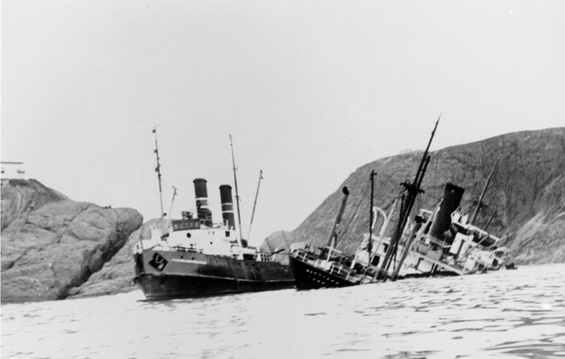 SS Marsland wrecked near Fort Amherst. Photo from Capt. Harry Stone Collection of the Marine History Archives, Memorial University. The crew quickly went to work, scrambling to dump some of the salt to lighten the load and float the ship. Unfortunately, she was firmly wedged onto the rocks. The agents of the ship decided to recruit two of the Reid's ships - Meigle and Argyle - to try and tow Marsland free. Not only did this fail (the lines kept breaking) but it caused the ship to haul further over, leaving her lying broadside to a 91m underwater cliff. Finally, a representative from the Salvage Association stepped in and said that an ocean tug would have to be used to free the ship. SS Marsland. Photo from Capt. Harry Stone Collection of the Marine History Archives, Memorial University. The Foundation Franklin arrived a few days later and her divers assessed the damage to Marsland's hull. The waves washing over her decks had caused some of her plating to buckle, and her bridge was almost entirely flooded. The divers tried to board up the bridge door, but the wood panels kept getting washed away. The St. John's shipyard supplied some steel doors, which were finally bolted into place. The entire fore section of the vessel was eventually sealed off, and the salvage team started the pumps. Very, very slowly, the Marsland regained some of her buoyancy. This didn't help the salvage operation - it made it more difficult. Since she was now floating with the waves, the ship was being shoved up against the shallows, and damage was occurring faster than the salvage crew could fix it. To top it all off, the weather was beginning to turn, and the crew of the Franklin was forced to abandon the project and head into St. John's to weather out the gale. When the storm finally cleared, the wreck was declared by the insurers to be a total loss. The crew of the Franklin returned to the wreck to retrieve their gear... only to find dozens of dories floating around the vessel. Local fishermen had gotten word that she had been abandoned, and were now salvaging what they could off the ship. "SS Marsland on the rocks at entrance to St. John's, Newfoundland." Photo from Library and Archives Canada. The Foundation Franklin got their gear, and the ship was stripped of what remaining fittings and equipment was on board and accessible. She was now lying completely on her side, with most of her stern submerged. The St. John's Port Authority was at a loss of what to do - at one point even toying with the idea of contracting out the HMS Norfolk to swing by and blow her off the rock with their guns. Thankfully, it didn't come to that. In October of 1933, a heavy autumn storm blew up. The Marsland was battered hard by waves against the shore, and finally she slid from the rocks and off the underwater cliff, coming to rest on the bottom of the ocean just outside the mouth of the harbour. So if you're ever in St. John's and down by Fort Amherst, take a look out in front of the lighthouse. You're looking right over the wreck site of the SS Marsland. Edit: A previous version of this entry said that the Marsland sank later that summer. According to the Western Star on October 18, 1933, she was swept out to sea following a severe autumn storm. You can find the article here.